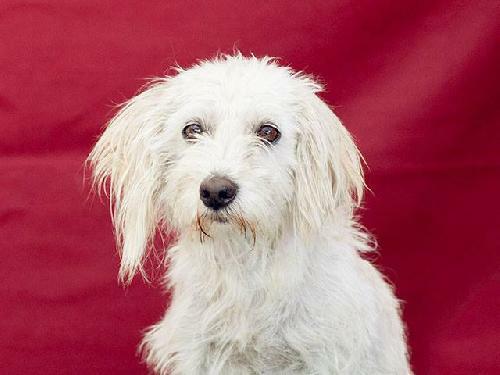 Trinket is an adorable two year old white female Terrier mix who was found in Walnut Park and brought to the Downey Shelter. Weighing fourteen pounds, Trinket has mastered basic leash skills. She has a medium energy level and gets along with all comers, human and canine alike, and we think she would be good with cats. She will also look spectacular after a good grooming. Trinket is a perfect indoor pet for anyone in any living situation, and is ideal for an older person or someone who works from home and is looking for a companion. Please lets find her a loving home! Cutie Pie is a Terrier mix who desperately needs to find a home not sit scared in a shelter that is overwhelmed with dogs. Please lets find her a great home! Noah, a four year old male Great Pyrenees. 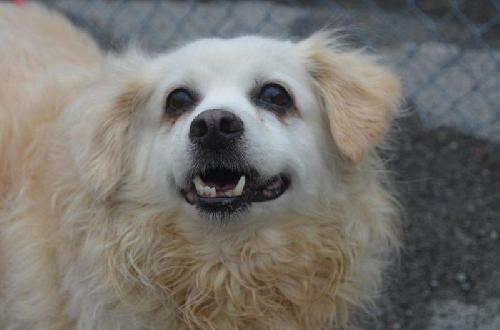 Noah came to us along with a family of three other Great Pyrenees that were surrendered to a shelter. Noah is a big, beautiful dog weighing in around 90 pounds and with a little time, his weight will top out around 100 pounds. Noah is a classic Great Pyrenees in his demeanor and temperament. He is calm, quiet and reasonably dignified with occasional outbursts of pure silliness. He is well-mannered and good on the leash,and in the home. People have let him down and he is eager to find some who won't. He is sensitive and responsive to his surroundings. He would like a quiet home where he is lavished with the attention he has not received and much deserves. Those who do not have other dogs or dog savvy, patient folks who are practiced with gradual introductions and experienced with sensitive dogs would suit him best until he understands he won't be let down again. A perfect dog in the right home. Anyone interested in this dog needs to have a firm understanding of what a Great Pyrenees is and what it does. This is a flock guardian breed which means his breed was created to guard sheep. Absent sheep to guard, you are his sheep and he will keep a watchful eye over you. Pyrs are low energy dogs and like most other Pyrs, Noah appears to be a sloth much of the time until he is motivated to move. Squirrels are good motivators. The Great Pyrenees breed were bred for independent thinking which means they don't much care what you want sometimes and they have selective hearing when you want them to come inside and stop barking. They are smart, sweet and stoic dogs with sensitive souls and Noah is a classic example. Noah will require a home with a secure fence. For the right family, this dog is an outstanding example of the Great Pyrenees breed and someone is going to be a very happy adopter. Please lets find him a good home! 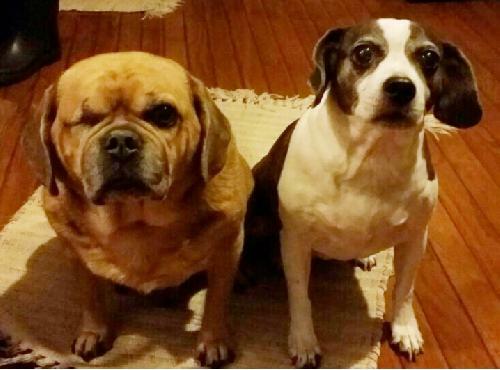 Meet Roxi and Rocky, two young at heart pooches who have been best pals since they were puppies over 10 years ago! Sadly their current owner can no longer take care of these wonderful and devoted friends, and they are in desperate need of a hero who can provide them a stable and loving new home. These caring and obedient buddies love cruising in the car, taking baths, getting towel dried, and meeting new people. Roxi is a female Boston Terrier and Beagle mix, born 9/30/2003. 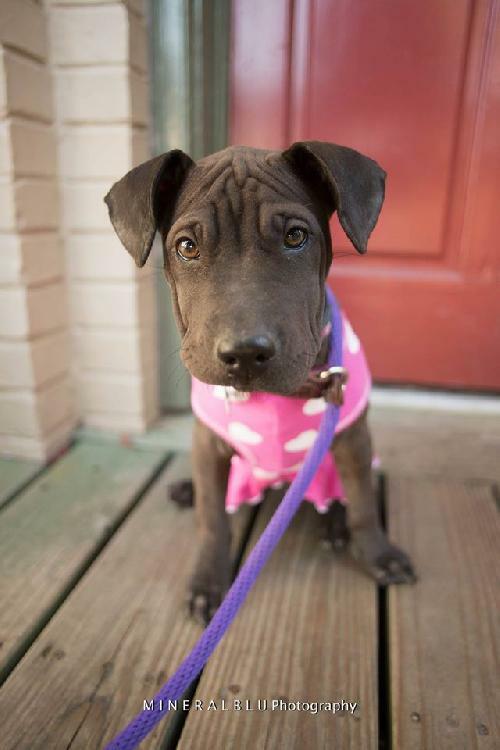 She is very smart and easy going, getting along well with other dogs, kids and strangers. She knows many commands and is just a wonderfully happy, contented pup. She is spayed, housebroken, leash trained, and in good health. Rocky is a male Pug/Beagle mix born 8/8/2004. The poor guy lost an eye when he was three but does not let it dampen his loving spirits. He gets along wonderfully with other dogs, kids, and adults, and just lives for affection. He is also housebroken, leash trained and understands many commands. He is allergic to chicken based dog food but hasn’t had any issues since he was put on a diet of hypoallergenic dog food. Please lets find them a loving home! 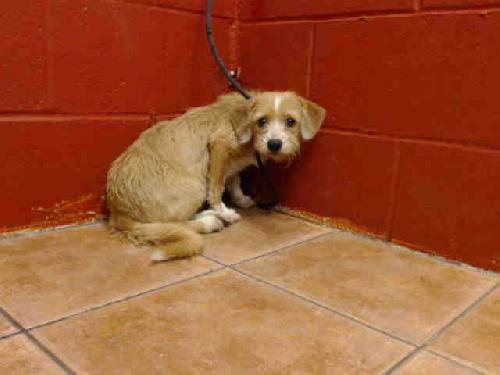 Good golly, Miss Molly, how did a nice girl like you end up in a shelter like this. Poor 8 year old Molly thought she had a home for life until her owner decided she wanted to travel, and her canine companion was cramping her style. So it was off to the pound for Molly, where luckily the volunteers fell in love with her and made it their mission to find her a real home.Tipping the scales at about 30 lbs., Molly is a homebody who needs someone who’ll encourage her to get out and get moving. Other than a few leisurely potty breaks now and then, she’s perfectly happy to curl up at your feet and help you watch TV. Her other favorite pastime is car rides and she prefers to ride shotgun :-) She knows the “Go for a ride?” drill, and will go right to the passenger side to get in (although you may have to help her up, as she forgets that she's a bit too chubby to jump in by herself). Molly gets along fine with other dogs, although she’s not a fan of the overly energetic, in your face types, and will grumble at them to go away if they annoy her. She’s really more of a people person and much prefers hanging out with her humans than with other dogs, and she pays no attention to cats. She would love a home where someone’s around most of the time, so a retired couple or someone who works from home would be perfect. Please lets find her a great home! Ruthie is a a 11-12 week puppy which means she likes to chew on things. Everybody says they love puppies and want one, but they don't want them to do puppy things. Well guess what, their teeth hurt. They are puppies and like to chew. She also likes to play chase with my foster siblings. They wrestle and play tug of war until we're pooped. Everyone who sees her can't believe... how cute she am.She has lots of wrinkles, because she doesn't have very much hair yet. It's growing back she had some skin issues but it's getting better. They are not sure what kind of puppy she is am everyone likes to guess, but no one knows for sure. And she hasn't grown very much yet. She looks a little like a pygmy Pit Bull. Or Sharpei, or Frenchie. Whatever, she is the cutest puppy in the whole world. She knows all about house training and rarely have an accident. Please lets find her a good home!